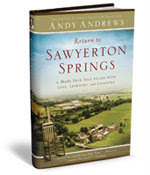 Return to Sawyerton Springs takes you to a simpler place. A place without internet, cell phones, even traffic lights. It's a place where everyone knows everyone and the whole town really cares about each other. Things move at a slower place in Sawyerton Springs. You meet a cast of characters that instantly steal your heart. Expect to see glimpses of people you know and love in your own life. You are drawn to these folks and their slow, simple way of life. The urge to sit in a rocking chair on someone's front porch is hard to resist. I thoroughly enjoyed Return to Sawyer Springs. It reminded me a bit of my own Podunk, neighbors, and family members. Filled with wit, wisdom, and characters that tug at your heart strings, this book is a must read! It reminds us to savor the simple, everyday pleasures in life. Ramblings of a Texas Housewife Product Review and/or Giveaway Disclosure- I have received no compensation other than the offer of free product to review and/or giveaway. Any opinions expressed on Ramblings of a Texas Housewife are my own. My reviews are never reviewed or edited in any way by sponsors.